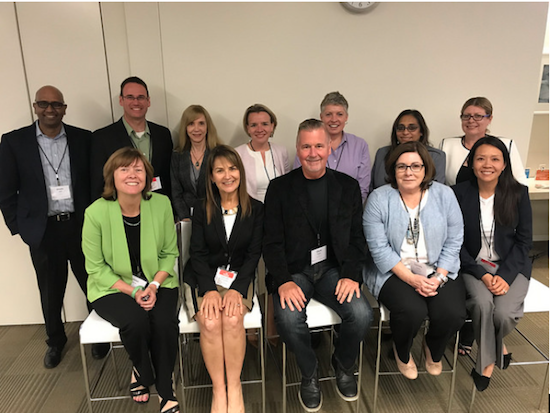 On May 22, 2018, WITI Orange County (WITI OC) held its Fourth Annual Executive Mentoring Circle. For those unfamiliar with mentoring circles, an executive sits at a table with 8-10 attendees. For 20-30 minutes, the attendees are free to ask ANY QUESTION of the executive. The questions and responses are not moderated, pre-planned, or rehearsed. Questions ranged from career advice, team productivity, budgets, life/work balance, and other topics. Vendors were asked to refrain from solicitation. Each attendee had the opportunity to sit with three different executives individually for 20 minutes. Julie St John, CIO, Capital Group Companies, Inc.
Carey Dunlop, VP of Global IT Systems, Capital Group Companies, Inc.
Heather Lord, SVP, Head of Strategy & Innovation, Capital Group Companies, Inc.
To keep this event relevant, different, and not repetitive (from last year), over 50% of the executives were first timers. This year the executive's perspective took a turn focusing on building talented and capable teams. Diversity is important in building good teams. Team members need to feel 'safe' to express their opinions to get a solid 360 degree perspective on a problem. You also need to know what your super power is that you bring to the team. The event had over 100+ attendees (both men and women). Attendee Ajay Parikh gladly shared 'pearls of wisdom' from three executives. When you're trying to sell your product/service to an organization, look to Star Wars for your inspiration about how to think about your relationship with your client. Never think of yourself as the hero who is going to come into an organization to save the day. Instead, think of your principal contact (one who will be the champion for you) as the hero such as Luke Skywalker and think of yourself as Yoda. Do everything in your power to support your client so that he or she looks like the hero to their organization. They will remember how you supported them and will be your greatest champion within the organization. When looking for your next role, you can't wait for the opportunity to come to you. Think about problems that the target company is facing and figure out a way to pitch yourself as the solution to one (or more) of those problems. As you move up in your career, you don't have to have every tech skill in order to move into that next more senior role. What's more important are the soft skills and leadership qualities such as relationship building, endurance, tenacity and resilience. Another attendee was surprised at how 'human' the executives are. They are not monsters who think of terrible things for employees to do and talk down to employees from a pedestal. They are down to earth and friendly. Obviously this recap does not begin to capture the advice or comments that were shared. My wife, and both my sisters are "Women in Technology": They are all self-described "proud super-geeks", just like me. Between the three families, we are sending three girls out to college and beyond to compete in the real world. How to make sure girls and women reach their full potential unfettered by anything other than their own smarts and hard work, is a constant topic of discussion in our family. I was inspired by what I saw at the WITI OC chapter: a great group of smart, motivated people organizing to unshackle the potential of other smart, motivated people. I got more than I gave when I participated in that mentoring session. WITI OC looks forward to seeing what next year's mentors will share.